The EAT-Lancet Commission on Food, Planet, Health has convened 37 of the worlds’ leading scientists to reach a scientific consensus that defines a healthy and sustainable diet within the limits of our global ecosystem. Their conclusions contribute to the specificity needed to align human behavior with the goal of sustaining the human species, while preserving the planet and allowing the world to feed up to 10 billion people by 2050. The Commission has delivered the first full scientific review of what constitutes a healthy diet from the perspective of a sustainable global food system, and which actions can support and speed up needed food system transformation. According to the Commission, if we want to live in a future where people’s health and the environment are not irreversibly damaged, the world needs to start living within scientific boundaries for health and the environment. Meeting the targets of the UN Sustainable Development Goals and the Paris Agreement requires an urgent and fundamental shift in the ways that we produce and consume food. The Commission proposes a “planetary health diet” as a global reference diet for adults that is symbolically represented by half a plate of fruits, vegetables and nuts. The other half consists of primarily whole grains, plant proteins (beans, lentils, pulses), unsaturated plant oils, modest amounts of meat and dairy, and some added sugars and starchy vegetables. The diet is quite flexible and allows for adaptation to dietary needs, personal preferences and cultural traditions. Vegetarian and vegan diets are two healthy options within the planet health diet but are personal choices. The current pattern of food consumption poses an existential challenge for humanity by contributing to both poor health outcomes and severe environmental degradation. Increasing food demand and the adoption of unhealthy diets including persistent hunger, generalized overconsumption, as well as overconsumption of unhealthy foods, lead to incredible strains on public health and have severe consequences on natural resources and the environment. As it stands, the global food system cannot meet the nutritional demands of a growing world population projected to increase to 10 billion by 2050 without irreversibly damaging the planet. To change this, the “planetary health diet” sets out scientific targets for healthy diets that will optimize human health. Adopting the guidelines can result in a reduction in undernutrition, overnutrition and diet-related noncommunicable diseases, which are continuously on the rise globally. Global uptake of the planetary health diet, however, could reduce approximately 11 million premature adult deaths annually, effectively contributing to a 19–23% overall reduction in premature mortalities per year. In addition, the Commission’s report also identifies environmental limits for sustainable food systems that define a safe operating space for food production within planetary boundaries. The targets emphasize those environmental processes most impacted by food, including climate change, freshwater use, contamination of water by nitrogen and phosphorus, and the loss of biodiversity. It also recognizes the significance of the vast areas of land appropriated for food production and the urgency of allowing natural ecosystems to contribute to climate regulation, provisioning of freshwater and conserving biodiversity. Access the EAT–Lancet Commission Hub page at The Lancet. 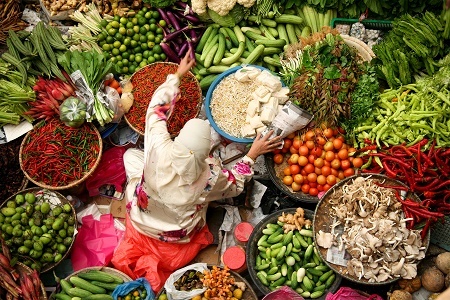 Download the full report: Food in the Anthropocene: the EAT–Lancet Commission on healthy diets from sustainable food systems.